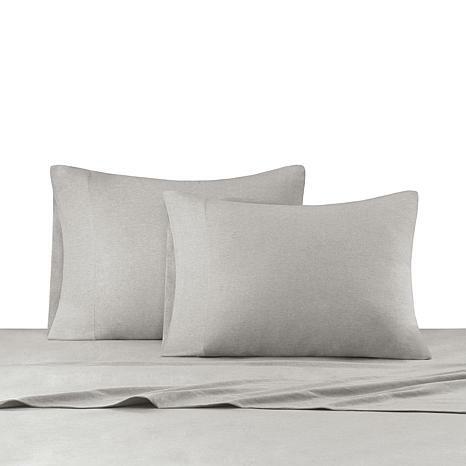 Made from 100% cotton, the jersey knit sheet set will remind you of the comfort of your favorite t-shirt. 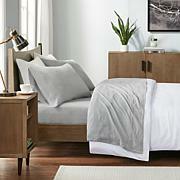 The sheet set features heathered colors for a relaxed casual look. It's soft, durable, and machine washable for easy care and is perfect for year round use. The fitted sheet fits up to a 16" mattress height. Includes a fitted sheet, flat sheet, and 2 pillowcases (or 1 Pillowcase for Twin sizes). These sheets are very comfy. Wash well too. Fit great, easy to put on and off. I got the gray very nice. Feel comfortable and fit well!